Researchers from University of Maryland, State University of New York, Woods Hole Research Center, United States Geological Survey, South Dakota State University, and Google published a paper this last week observing forest loss and gain between 2000 and 2012. 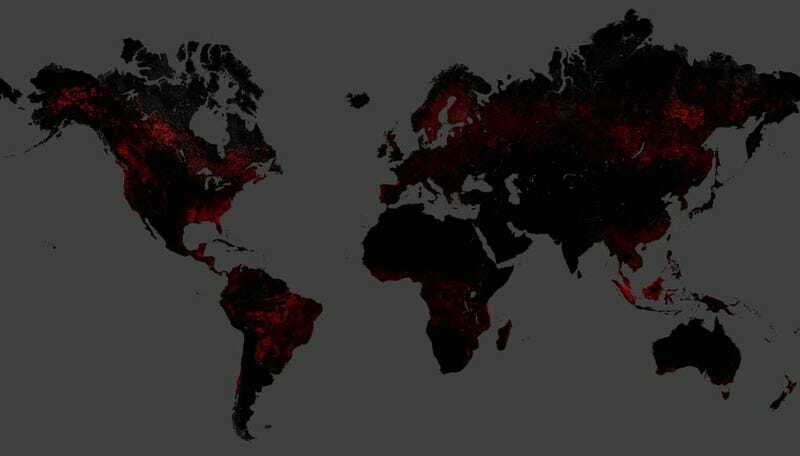 The authors of "High-Resolution Global Maps of 21st-Century Forest Cover Change" used 654,178 Landsat images to chart areas of forest loss, and gain, over the past dozen years. This results in a lot of images, which you can look at, right here. Malaysia and part of Indonesia show off untouched forest (green), forest loss (red), forest gain (blue), and areas where both occurred between 2000 and 2012 (pink). Southern California didn't need forest anyway. For people who like numbers, about 2.3 million square kilometers of forest were lost in those years, while 800,000 square kilometers grew, so that's a net loss of 1.5 million square kilometers (an area a bit smaller than the country of Iran, or just a bit bigger than Alaska) of forest in twelve years.